The world woke up to the news Monday morning that outspoken Greek finance minister Yanis Varoufakis had, at long lost, been dismissed by his prime minister, Alexis Tsipras. 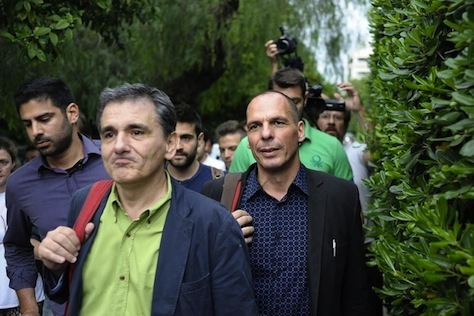 Varoufakis (pictured above, right, behind Greece’s new finance minister, Euclid Tsakalotos) had become, to say the least, a brake on negotiations with the Eurogroup, even though his widespread popularity and strident anti-austerity boosted Tsipras’s government to a stunning victory in Sunday’s debt negotiations referendum, whereby 61.31% of voters rejected a prior plan offered by Greece’s European creditors. European officials struggled to reach consensus with Varoufakis, who just last week, in the middle of the rushed referendum campaign, referred to his European ministerial colleagues as ‘terrorists.’ Tsakalotos, an Oxford-trained economist, is expected to take a more mild-mannered approach, and he already supplanted Varoufakis as Greece’s chief negotiator back in April. That was, however, only to the extent anyone could supplant the motorbike-riding, free-wheeling Varoufakis, who gave his final press conference as finance minister Sunday night in a t-shirt. Varoufakis’s resignation, along with a pledge of national unity across Greece’s mainstream domestic political spectrum, breathed new life into hopes for last-minute talks for a third bailout, allowing the country to reopen its illiquid and perhaps insolvent banks, lift (at least partially) capital controls that have limited daily cash withdrawals to €60, restore liquidity to ATMs that have run out of cash altogether, address Greece’s €1.6 billion default on June 30 to the International Monetary Fund and meet a July 20 deadline to make a €3.5 billion payment to the European Central Bank. For all the celebration that followed the resounding ‘no’ vote in Sunday’s referendum, the coming Sunday could bring financial austerity far more severe than Greece has known in the past five years, marked by a nearly 30% drop in GDP growth and a 26% unemployment rate. Failure to reach a deal could result in a shortage of cash, food, medicine and so many other necessities to the extent that European leaders are whispering that Greece could require humanitarian aid. Notwithstanding the dire consequences, a deal is not necessarily likely — or even possible. If they’re lucky, the European Union has five days to prevent Grexit. Here are four reasons why it will be so difficult in the hours ahead. Though photos from Tuesday’s Eurogroup summit showed that Tsakalotos has scribbled ‘no triumphalism’ on his notes, the Greek government clearly expects that it can reach a deal with terms as good as those on offer before last week’s referendum. That now seems unlikely, and the final offer from Greece’s creditors might actually be even more restrictive than the terms of the deal that over 61% of last week’s electorate rejected in the hastily arranged referendum. It must certainly come as a shock to Europe’s leaders that neither Tsakalotos nor Tsipras (pictured above during a somber, post-referendum address on Sunday) came, respectively to Tuesday’s Eurogroup meeting and leader’s summit, with a firm proposal for a new bailout. That must have been a particular disappointment to the dwindling handful of officials who still seem to want to help Greece — like French president François Hollande, Italian prime minister Matteo Renzi and France’s representative to the European Commission, Pierre Moscovici, all of whom have argued that the eurozone needs more growth-oriented policies and who have hinted in recent days that debt relief for Greece might be possible. German chancellor Angela Merkel since Sunday night has argued that debt relief is ‘out of the question,’ and she has wondered if there even exists a basis for future negotiations. Nevertheless, Tsipras and Varoufakis had been adamant that any new deal must include a restructuring for Greece’s nearly €320 billion in debt. That’s typically interpreted as a demand for a haircut from Greece’s institutional creditors — the ECB, the Commission and the IMF. But it might also mean extending Greece’s repayment period to 40 or 50 years or, potentially linking the country’s debt service to GDP growth, thereby aligning incentives of both lender and borrower. 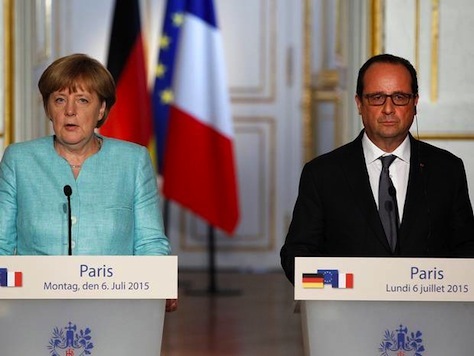 If Europe offers even tougher terms for a potential third bailout, it will be because Merkel (pictured above, left, with Hollande in Paris on Monday) and her allies have decided the risks of a disordered Greek plunge from of the eurozone (and all the power that such a precedent would set) are not as dire as the risks of angering German taxpayers. Germans are increasingly unhappy about the idea of throwing even more money — possibly up to €60 billion — at a country whose leaders are calling Merkel and her colleagues terrorists and nazis, especially after forking up nearly €90 billion, Germany’s share of the €240 billion that constitutes Greece’s first two bailouts. Merkel knows that if she grants significant debt relief to the Greeks — and to the Tsipras government, in particular — she will face the wrath of conservatives within her own party, Christlich Demokratische Union Deutschlands (CDU, Christian Democratic Party), who favor Greece’s exit from the single currency. That must now certainly include her own finance minister, Wolfgang Schäuble, who seemed to delight in scorning Varoufakis, and virtually all of the members of the CDU’s Bavarian sister party, the Christlich-Soziale Union (CSU, Christian Social Union). Making an example out of Greece, while attempting to limit the contagion to other sluggish eurozone members, would only boost her domestic political image. Merkel, who is reported to have her eye on winning a fourth consecutive term in Germany’s next elections, due before October 2017, has already moved far to the center in her bid to co-opt the center-left Sozialdemokratische Partei Deutschlands (SPD, Social Democratic Party), ceding space on the right to the more eurosceptic Alternative für Deutschland (AfD, Alternative for Germany), which has won seats in five state elections in the past 12 months. That might be why Sigmar Gabriel, the SPD leader, vice chancellor and economy minister, so forcefully argued after last Sunday’s referendum that Tsipras had torn down the bridges between Greece and Europe. By outflanking Merkel herself, Gabriel could score some easy political points for a party that’s now tethered in a grand coalition with the CDU and trailing by double digits, as it has for much of the Merkel era. If Tsipras wins debt relief, it could empower the Spanish far-left party Podemos, whose popularity remains strong in advance of federal elections in December. The moral hazard argument rings somewhat hollow, though — it’s hard to believe that Spain or any country would want to repeat what Greece has endured since 2010. But it’s not just German taxpayers who resent the Greek drama. European Commission president Jean-Claude Juncker revealed Tuesday that the European Union had a ‘detailed plan’ for dealing with the looming ‘Grexit,’ and he all but announced, in a joint conference with European Council president Donald Tusk, that a planned Sunday summit of all 28 EU leaders would not be a down-to-the-wire plea to save Greece but instead a session to deal with Greece’s eurozone exit. Dutch prime minister Mark Rutte said he was ‘extremely somber’ about the prospect of Sunday’s summit, even as he doubted the seriousness of the Tsipras government. Jeroen Dijsselbloem, the Dutch official who heads the Eurogroup of eurozone finance ministers has been equally pessimistic. Finland’s new foreign minister, Timo Souni, the leader of the nationalist Perussuomalaiset (Finns Party), ran in spring national elections on a pledge that he would refuse to give any more Finnish money to Greece. 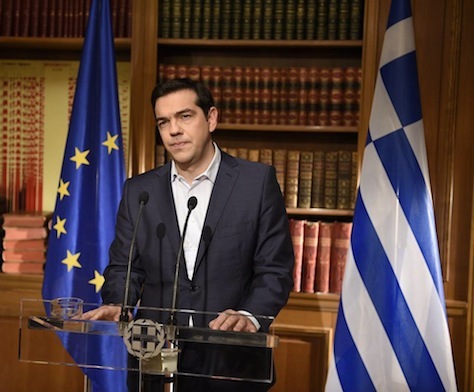 Lithuania’s president Dalia Grybauskaitė mocked the Greek government, snarking that for Tspiras, every day is mañana. 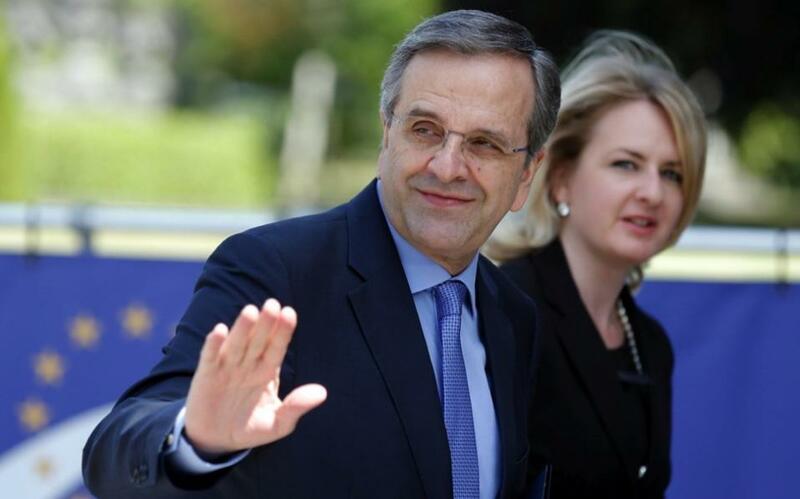 Though Varoufakis’s resignation received far more attention, it’s perhaps the resignation of former prime minister Antonis Samaras as the leader of Greece’s largest opposition party, New Democracy (Νέα Δημοκρατία), that matters more to Greek domestic politics. RELATED: What are the chances of snap elections again in Greece? Samaras is widely despised for his role in the grinding austerity that Greeks suffered between 2012 and 2015, and any position of national unity between Samaras (pictured above) and Tspiras was impossible. The nephew of a long-time influential legislator, Samaras represents the cozy ties of the Greek elite of both the right and left. Samaras once shared a room at university with George Papandreou, the former center-left prime minister who accepted the terms of Greece’s first bailout in 2010. Tsipras has welcomed talk of reforming the Greek economy to reduce the corruption and tax evasion that’s benefited the country’s wealthy — one of the policy areas where he and Varoufakis managed to convince reluctant Europeans that they were serious about reform. For now, Tsipras can point to the landslide referendum victory as a mandate for the week ahead, no matter the outcome. But if he agrees to a deal with terms similar to (or worse than) those rejected in Sunday’s vote, Tsipras could split his party, the governing SYRIZA (the Coalition of the Radical Left — Συνασπισμός Ριζοσπαστικής Αριστεράς). It’s almost certain that 30 or 40 SYRIZA legislators, who form the Left Platform (Αριστερή Πλάτφορμα) faction within the party, would oppose any deal that doesn’t include debt relief. Many more may balk, arguing that a return to a devalued drachma would boost Greece’s long-term economic horizon. If Tsipras can’t rely on his governing coalition, which also includes the nationalist, anti-austerity Independent Greeks (ANEL, Ανεξάρτητοι Έλληνες), he will have no option but to turn to three other parties — the center-right New Democracy, the atrophied center-left PASOK (Panhellenic Socialist Movement – Πανελλήνιο Σοσιαλιστικό Κίνημα) and the relatively new To Potami (Το Ποτάμι), a centrist party. That might be easier with Samaras’s resignation, but it’s still not a step taken lightly. The last time Tsipras had to choose between a deal with Greece’s creditors or splitting his party, he struck out on a third path — calling a risky and arguably unconstitutional plebiscite. Facing the same choice by the end of this week, no one knows whether Tsipras commands enough support to push a new deal (especially one with tough conditions) through the Greek parliament. If not, there’s a real risk that a new debt deal could bring down Tspiras’s government — and force snap elections that might relegate him, just six months into office, forever out of power.